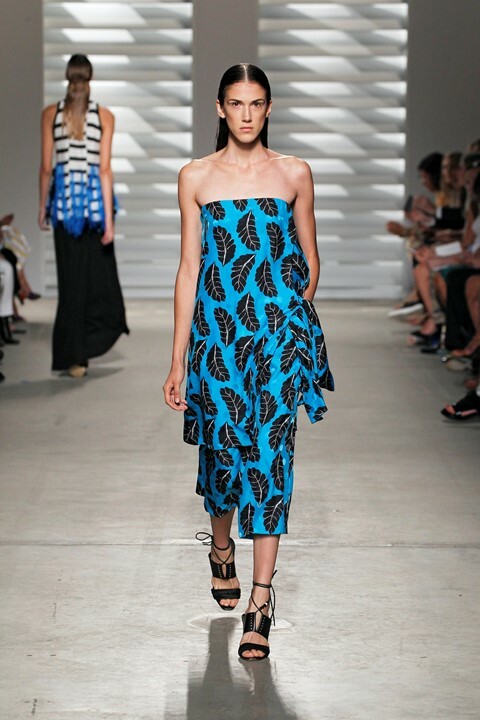 To the feverish beat of a samba drum, Thakoon took us on a languid stroll through the tropics. The slow, ponderous clack of wooden wedges contrasted with a breezy silhouette of summertime ease: glimmering robes, skirts, palazzo pants in long, swishing silk. A red-and-white banana leaf pattern cued The Woman on Vacation, translating into raffia fringe and seed beading, and straight, wet-combed hair that appeared to crackle like sun-drenched straw. "I've never been to Brazil!," the designer later admitted backstage. Could have fooled us. Carnival in Rio weaved its colourful debut onto a striped black-and-white skirt, in the form of a fluttering fringe of blue flax-raffia. Later, through the echoes of Black Orpheus, a palm-printed electric turquoise look stole the stage, followed by graphic showstoppers, like a slivery georgette gown with bold patches of black and white, wound together like a braid across the body. While striped light through a chorus of window blinds gave an impression of the morning sun, we were roused from a damp sleep by Ninos du Brasil's "Sombra Da Lua", then seduced by a guitar into a half-lidded idyll.